Tessa Dare is in my opinion one the most haunting of authors in historical romance to date. Her stories are equal parts heartbreaking but highly unforgettable. The Duchess Deal takes a few cues from Beauty and the Beast and like the thief of the night Ashbury presents himself to be runs away with a readers soul. Emma is the owner of a lonely heart. Ashbury is the keeper of a broken spirit. Their's is a relationship of convenience until emotions become involved and the terms run away with their hearts. Nothing is as beautiful as the courageous and seductive romance of two lost souls finding a forever home in each others arms. One of the best heart warming stories that I have ever read. A total delight and witty. Definitely a keeper. Thank you for sharing this awesome and well-written romance. The banter between the two main characters make this book difficult to put down If you are looking for a novel that will make you laugh out load then this book comes highly recommended! 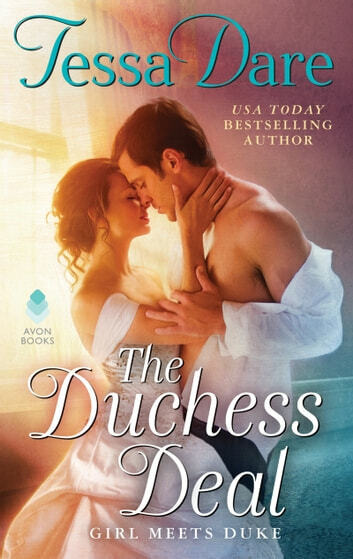 The Duchess Deal by Tessa Dare (Audio Edition) Narrated by Mary Jane Wells Series: Girl Meets Duke, book 1 5 HUGE FUNNY STARS! This book was fantastic!! It was super funny and had me laughing within the first few paragraphs! The writing was superb, the use of uncommonly used words, in just the right spots made all the difference. The wounded/tortured hero is not my favourite plot line, as usually I find them too sulky or whiny. This book did not conform to that. While Ash did sulk, he did so with flair and wit. I loved how Ash was actually a good person, how he longs to love her.. and how sometimes he just can't stop himself from doing so- even when he tries to. Emma was a strong leading lady, she stood up for what she wanted and didn't let Ash get away with anything. She kept pushing his boundaries and they had wonderful chemistry together. The narration fantastic! Mary Jane Wells has a style all her own and pulls out the sarcastic wit that was needed for this audiobook to succeed! I highly recommend this book and I am sad it is over… because how will the next book I read compare?!? !